Mariel here. So as I’m sitting down to write this, I’m facing my first weekend away from my babe…leaving him in the capable hands of my husband. They don’t make better dads, but I can’t squelch the niggling suspicion that I’ll return home to an overtired, over-stimulated crank pot on Sunday. And to a nursery smeared with poop. Does he even know how to change a Diaper Genie? Help. To combat my anxiety over the whole thing, I’ve been making lists. Lots of lists. My son’s daily schedule – or the manifesto as my friend calls it – features a play-by-play of his usual day, including necessary details like “play on the mat or do whatever until breakfast.” I also compiled a list of the things my son can and cannot eat, which is broken down into foods currently acceptable for consumption in the “pantry,” “fridge” and “freezer.” I even pre-wrote a card for our nephew’s baptism and taped that to the fridge too, lest my sister-in-law think we’re forgetful jerks. Right now you’re a) rolling your eyes b) nodding your head in sisterly communion c) wondering why I’m telling you this. My husband, to his credit, is being an excellent sport. He even said he felt like he’d been given a “promotion” because of the boost in responsibility (which definitively answers Tony Danza’s question as to Who’s the Boss). I know everything will be fine. I mean so what if the kid samples some Diet Pepsi, or nuzzles his perfect face into the filthy pet bed. Just so long as everyone stays intact and the child continues to prefer me upon my return, then no harm done. All of that was a very long way of telling you I made these ridiculous cookie bars for this month’s Secret Recipe Club. As I mentioned last week, I volunteered to make dinner and dessert for everyone at the bachelorette I’m attending. I had the dinner part nailed down, but dessert was still up in the air. I haven’t really done much baking since my baby was born, but clearly Hugs and CookiesXOXO knows her way around a mixer. How blog author Danielle can function with so much sugar coursing through her veins I’ll never know, because this woman has a sweeter sweet-tooth than I. She has so many ridiculously tempting treats on her site I didn’t know where to start. So I ended here. Salty, sweet, soft yet crunchy, these bars hit all the marks. In fact they’re so overwhelming I could only handle one. I invite you to make them, but only do so if you’re headed straight for the couch. 1. Pre-heat the oven to 350 degrees. Spray a 9×13 pan with Pam then line with parchment paper. 2. In a small bowl, whisk together the flour, baking soda and salt. Set aside. 3. In the bowl of an electric mixer, add the butter and sugars. Beat until light and fluffy. Add the eggs and vanilla. 4. Reduce speed to the lowest setting and stir in the flour mixture. 5. Turn the mixer off and add the pretzels and chocolate chips, incorporating with a wooden spoon until just combined. 6. Spread the batter into the prepared pan and bake for 2-25 minutes until the edges are just turning golden. I suggest undercooking ever so slightly so the inside stays soft and doughy. 7. Let cool completely on a wire rack. 8. Drizzle with caramel and sprinkle with a little sea salt. Cut into bars. It IS a brownie/blondie kind of day, but who knew pretzels would be part of the mix. The sweet salty combo sounds SO tempting. These look so good!!!! 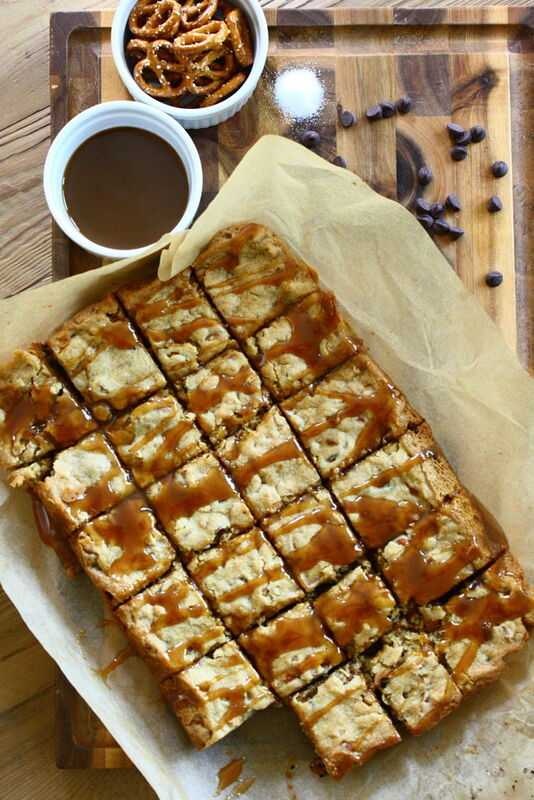 I love blondies, and the pretzel/salted caramel flavors sound DIVINE in these!!!! YUM!!!! Oh, yes I really have to make these! I think my kids might like some too. These bars look great! I love, love, love the addition of pretzels to any dessert. Hope you enjoyed a little time to yourself, Mariel! I’ve GOT to make these blondies for my husband – he’s been eyeing desserts with pretzels in them, and these totally look like just the thing. LOVE salty-sweet desserts! This looks delicious! Oh wow! These bars look like the perfect combination of sweet and salty goodness! These look SOOOO good. I would have to hide these or I’d gobble up the whole pan! Oh that caramel drizzle! These look absolutely divine. Have a great weekend away – sounds like you deserve it! Yum 🙂 that photo is beautiful! This looks divine! I love a good sweet/salty combo. I’d put sea salt on every dessert if my husband wouldn’t call me crazy for it. So, I made my own version. Really, it just comes down to the perfect combination of salty and sweet. Thank goodness for gluten-free pretzels ( Glutino are my favorite). These are so simple and don’t require baking. I keep these in the freezer, but you can also keep them in the fridge. It’s usually after dinner when these start calling my name. There’s something magical about the combination of peanut butter, pretzels and chocolate. I can’t explain it, there just is.